Councilman Hiram Monserrate is accused of assaulting his girlfriend. A city councilman denied he intentionally slashed his girlfriend in the face with a broken glass and called the incident an "unfortunate accident." 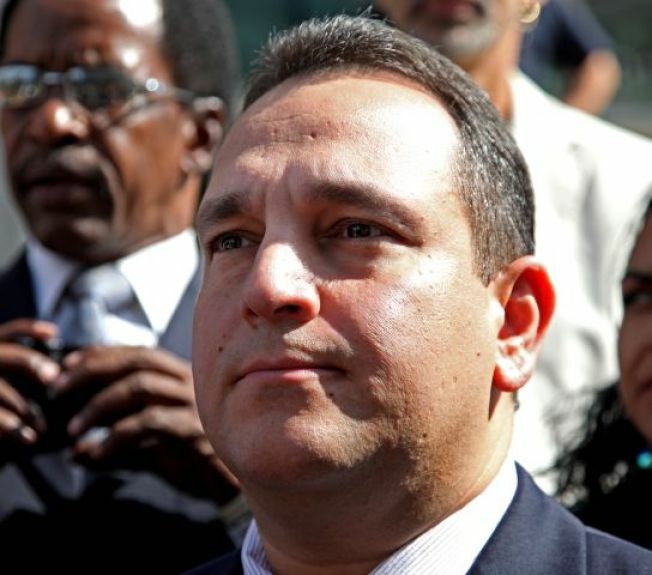 "I have been charged with offenses that I did not commit and am not capable of committing," Democratic Councilman and state Sen.-elect Hiram Monserrate said in a statement a day after he was arrested on domestic violence charges. Monserrate got into an argument with girlfriend Karla Giraldo, 30, early Friday at his Queens house, according to a criminal complaint. Giraldo said Monserrate, a former police officer, broke a glass in his hand and cut her face with it, causing her to need 20 stitches around her left eye. Monserrate, 41, a former police officer, disputed what happened and expressed concerns about how the case was handled. Describing the episode as "a terribly unfortunate accident," the councilman said, "I have absolutely nothing to hide, and all facts will become known at the appropriate time." During 12 years with the New York Police Department, "I worked to put men who abused women in jail," he added. In court papers, Monserrate has said he tripped while holding a glass of water, and the glass accidentally hit his girlfriend. During Monserrate's arraignment Friday, a prosecutor said Giraldo had changed her story, also saying the incident was an accident and asking not to proceed with charges. Monserrate was elected to the state Senate last month and is to be sworn in Jan. 1. He's already taking heat from colleagues because of the arrest, which landed him on the front page of city's tabloids. One headline screamed: "Pol's Date Rage." Manhattan Borough President Scott Stringer said Saturday he was "appalled" by the allegations and called on Monserrate to recuse himself from any role in his remaining days in the Council. Monserrate was charged with two counts of assault and one count of weapon possession. A judge set his bail at $5,000 and barred contact between the councilman and Giraldo.